Every so often, I have an SOS telephone call from a friend in desperate need of information about some aspect of Chinese food. Usually they are out for the evening in central London, have a sudden and overwhelming urge to have dinner in a Chinese restaurant, and want to know where to go. One friend called me to ask me which restaurant I could suggest; a little later, seated in the restaurant I’d recommended, he called again to ask for tips on which dishes to order; and a couple of hours afterwards he called once more to give me a report on the meal! My friend picked up my email on her Blackberry, and within the hour I received the photograph above! Apparently the cooking session was a great success. Just to be sure, are you suggesting that Organic Tamari Soy Sauce (You’ve recommended Clearspring before) can stand in for dark soy sauce, or both light and dark? Tamari soy is much closer to the traditional Chinese soy sauces that are used in places like Sichuan and Zhejiang than the Cantonese light and dark soy sauces that are generally found in Western Chinatowns, and which now seem to be popular all over China. Tamari has a good salty taste, with a much richer flavour and a darker colour than the basic light soy sauce (but not as intensely dark as dark soy sauce). In general, you can use tamari as a flavour substitute for light soy sauce, and because of its fairly intense colour, you may not need to add extra dark soy sauce for a dark sauce or marinade. If, however, you wish to achieve a really dark colour, you can add extra dark soy sauce. This is how I use these products at home: I rely mostly on tamari because I love the flavour, and I add dark soy sauce occasionally for extra colour. Hope this is helpful! Very interesting post – I have been cooking some of your recipes on my blog – http://www.saladdaysoffalnights.blogspot.com/! Quick question – I want to get Szechuan preserved chillis, I got something in a shop which is chopped green chillis in oil in a glass jar, taste amazing but don’t seem fermented at all. They say Szechuan on them – is that what you mean by the term? Glad you’ve been inspired by my book! The classic Sichuanese pickled chillies are longish, scarlet, and pickled in brine, with a mild, sour-spicy taste. I don’t think you can buy these in London. The nearest substitute I’ve found for the fine-chopped pickled chillies is sambal oelek, which can also give your dishes a rich, orange-red colour and a nice sour-spicy taste. What you can buy in Chinatown is what in Sichuan they call yeshanjiao 野山椒 – ‘wild mountain chillies’ – which are small, dull-green pickled chillies with a hotter taste, but equally fermented. Of course you can’t use these in recipes where you want that gorgeous red-oil colour. Good to hear about the soy. I have been using artisan Japanese soy for a long time, tastewise they are unique and fresh. I am a big fan of your books and your blog. The “emergency helpline” post reminded me of something I wanted to ask you. I repeated used your recipe for kung pao chicken to the point that I made up a batch of the recipe sauce and have it ready in the fridge so I don’t have to measure everything out each time I make it. Is it possible that you could suggest several sauces (by sauces I mean the liquid ingredients for stir fries) from your books that could serve as other “pre-made” sauces? I know that I would like to be able to simply take the meat and vegetables that I have on hand on any given day and create a dish, based upon the general guidelines in your books of the order to add oil, aromatics, garlic/ginger, etc. Thanks for the info Fuchsia. Are these the mountain ones you mentioned? Moreorless probably – except that they are 双椒, which means two types of pickled chilli, red and green. I can’t tell from the jar if the green ones are the little ‘mountain chillies’ or larger ones. Thanks for that. They have a really nice, almost curry-spice type tang to them. I just want to say that the vinegar in my opinion is a knockoff. The label on the neck of the bottle should be the award that was given instead of the Emperor thing. However they probably taste the same. Excellent shopping list. Personally, I would definitely add the black beans to the ‘Most Vital’ section, though, I just LOVE them. Unfortunately, here in Berlin the original Sichuan Chili Bean Paste is nearly impossible to find. For all Berliners looking for the ‘real McCoy’, the Vinh-Loi Asia Shop at Rheinstrasse carries it. I always keep at least 3-4 bags in storage, just in case they don’t have it anymore at some point… It has long become an essential ingredient for me, and the jarred Hong Kong variety is a poor substitute. It seems that Pao Hai Jiao is hard to find everywhere. It struck me that maybe it is something that we could make at home. I have hd no luck finding a recipe yet. Anyone? Your readers might be interested in the French names of Chinese ingredients which can be found on the web site associated with my book at http://www.cuisines-chinoises-regionales.com with its detailed descriptions and images of the recipes and ingredients, and with its recipe of the month! The Chinese names are given for the recipes and their ingredients so that you can easily order the dish in a restaurant or find the ingredients in a specialty food market. I agree with most items on the list. perhaps add star anise, preserved mustard green and preserved mustard tubers? dried wood-ears and bamboo shoots are also useful. It really depends on what you’re going to cook. For example, Sichuan chilli bean paste is only vital when making Sichuan food. For Hunan food you need fresh chillies. For Beijing dishes you would need yellow bean paste, etc. To cook dishes from Shanghai region, you probably won’t need any chilli related product at all, but some tofu/deep-fried tofu/dried tofu sheets would be handy. 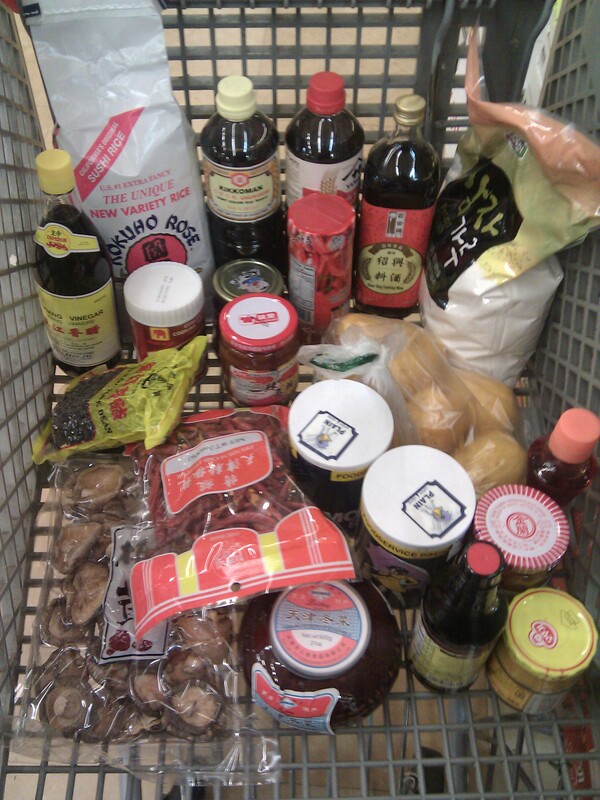 When I was a student with limited funding, all I had was light and dark soy sauce, shaoxing wine,sugar, star anise, sesame oil, vinegar, ginger, garlic and spring onion, with a few packets of dried/preserved food. It’s the kitchen cupboard essential as far as I remember. Many of your recipes call for potato flour, which I have found impossible to find. However, I have found potato starch, both in Western and Asian groceries. The two aren’t the same thing. When you call for potato flour, do you mean potato starch (also called potato starch flour)? BTW, since a trip to China in June I’ve been obsessively cooking my way through your two books. Aside from the potato starch/flour conundrum, it’s been great! Yes, potato starch is the one your need. Glad you are enjoying my recipes! I have run out a rather uninspiring bottle of chinese chilli oil which I have been using for the recipes in your fabulous book, so I would now like to make my own. What shall I look for when I look to buy Korean or Szechuan chilli flakes online (I live in the countryside so depend on the internet for this kind of thing)? Is it the Red pepper powder/ Gochugaru? Thanks for your wonderful book, so helpful to have images or ingredients and great recipes. 2. They should be only mildly spicy. If you want to pep up the oil, you can add a proportion of hotter chillies. But you want the base to be mild enough to use in large quantities, for its lovely colour.